lens: The magnifier is fitted with a Dia 145mm optical glass lens of 5x. - Size: Length -6 inches (15 cm) and 3 inches glass diameter. 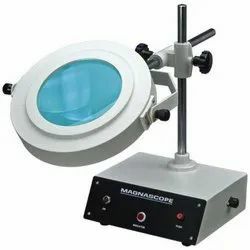 Being one of the reckoned enterprises in the market, we are highly affianced in offering an optimal class gamut of Vintage Table Magnifier to our patrons. We are instrumental in offering Antique Table Magnifying Glass to our clients. The offered range is made by using optimum-grade material that is sourced from most trusted people of market. Our range has a finely carved handle that has an appealing look. The magnifier i fitted with a precision lens of 150mm diameter and with an optical glass lens of 3x. It has maximum possible power for a lens of its size, consistent with gives fatigue- free, stereo view equipped with round fluorescence tube (22Watt ) which has shadow -less illumination. It is fitted o a universal stand fully adjustable vertically and horizontally, works on 220VA.C. Brass Stand Magnifier with brass and wooden base in antique finish also available in nickel and polished finish. The range of table magnifiers, the table magnifiers offered by us can be customized according to the specific requirements of our clients. These Table Top magnifiers are made by using very high quality raw material which ensures high durability at its user end. These Magnifying Glass Stands are available in various designer patterns. We are a Table Top Magnifiers in Chennai. We are a leading supplier of Testing and Measuring Instruments, Inspection Instruments in Leading Brand Mitutoyo and other brands. These brands are available for Competitive price to our customer. Stand Magnifier with a distortion free Glass lens. Well constructed Magnifying hands free Illuminated Desk, Table, Stand Reading Magnifier with many uses, such as hobby, crafts, reading, assembly, and inspection. The lens of Illuminating Magnifier is 3.0 inches at 2.5X. 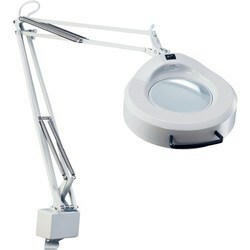 We are offering Table Magnifying to our client.